Customers always ask for suggestions on what size dumpster they should order. Sometimes you’re able to measure, but most of the time you’ll need to estimate. Using a pick-up truck with an 8’ bed as a guideline, the truck bed is 2 cubic yards when filled level to the top. Therefore, a 12 yard container will save you 6 trips to the landfill. 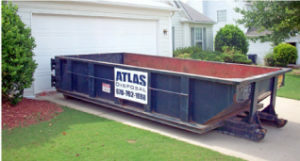 This dumpster rental includes 7 days worth of rental time. Once you place your order, a work-order for it’s removal will automatically be placed 7 days from the delivery date. You are not required to be present for the delivery date or the removal date. We always recommend that you leave placement instructions for our driver when placing your order. You can leave these instructions over the phone, or you can list them in the “customer notes” section when placing an online order. On the day of removal, we ask that nothing block the dumpster which would prevent our driver from accessing it. A $195 Deadhead fee will be charged to your credit card if the dumpster is not free and clear of obstacles for a Swap out or Removal. Please note that this haul price includes 2 tons. That means the price will stay $270 as long as the contents inside the dumpster do not exceed 2 tons worth of weight. (4,000 lbs). Loads weighing greater than 2 tons will assessed an additional $47 per ton over 2 for cities such as Acworth, Canton, Cartersville, Kennesaw, Holly Springs, Woodstock, Waleska. Loads weighing over 2 tons in cities like Austell, Mableton, Powder Springs & Smyrna will receive a charge of $59 per ton over 2 tons. New Year – New Exciting Changes ! 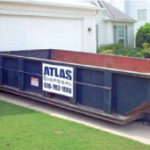 Copyright © 2012, Atlas Disposal. All rights reserved.